Another Handel arias disc? Yes; although for once not just a rundown of usual arias from roles a singer happens to have sung recently but a carefully themed recital which brings into the light music that has for the most part languished undeservedly in obscurity. 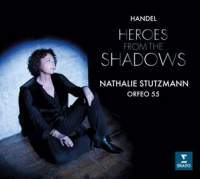 ‘Heroes from the Shadows’ takes as its subject arias written for Handel’s secondary characters which, though less celebrated, have just as much of the composer’s genius in them. For Handel makes no distinction: arias for subsidiary characters are as likely to be as vividly illuminated by psychological insight as those for leading roles.